Life is like a train journey- filled with thrill, excitement and apprehension. The crests and troughs are plenty but the blatant truth that the passengers are unaware of the circumstances that might arise during the course of reaching the final destination makes the expedition even more intriguing. ‘Phases of Moon’ is relatable yet the writing style is abecedarian. Simple poems with soothing rhyme scheme highlight the emotional state of each stage of life of a girl. Beginning with the dilettante, the poems progress through the transcendent steps of adolescence, adulthood- leading to maturity. 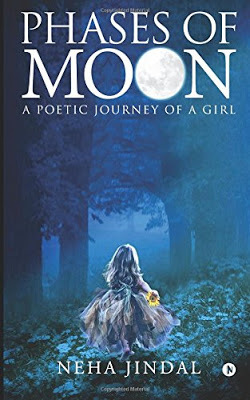 Heart-warming poems that offer moments of genuine heartache make ‘Phases of Moon’ a successful attempt at capturing the true feelings. However, I wished that the stage after marriage should have been included too because unison with another person is not a phase; it is a permanent change which has to be accepted. The illustrations in the book are beautiful but unfortunately, they do not blend well with the theme. Had it all been done in broad strokes, the poetry would have been more impactful. Editing is a problem here; even in the blurb, unnecessary commas and missing structures leave a negative impression on the readers. The book has a lot of scope for improvement. But if I were to review the debut effort of the poetess, I would not abstain from appreciating the thought process and mindfulness while writing the poems. Good luck!